In this article we want to look at some of the most expensive watches in the world. For these watches you do not have to put down several thousand euros or as much as for a Porsche 911 Turbo, but almost astronomical sums – in some cases, several million. For. A. Only one. Clock. This is just an overview of some of the most expensive watches in the world. We are aware that Audemars Piguet, A. Lange & Söhne and a handful of independent watchmakers manufacture timepieces that are similarly expensive or even more expensive. 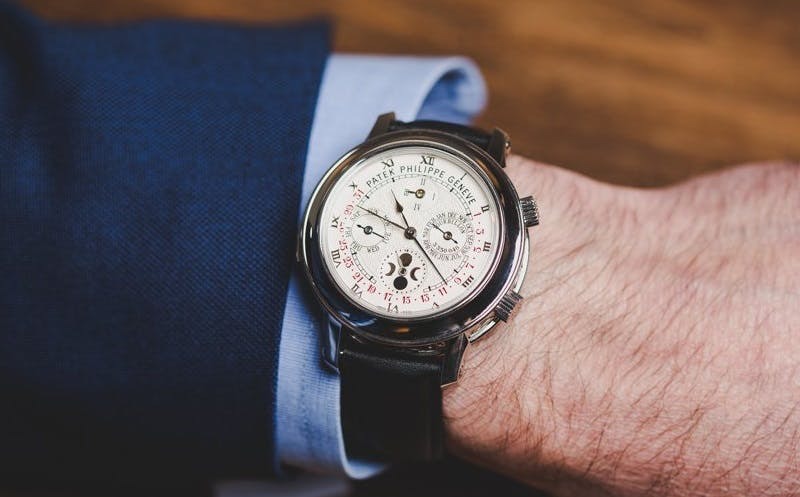 We will not include any auction proceeds or record sums in this article because they vary widely and the prices of vintage watches and one-off items depend on a variety of factors. If you think that we have forgotten a watch that is definitely on the list, please leave us a comment. 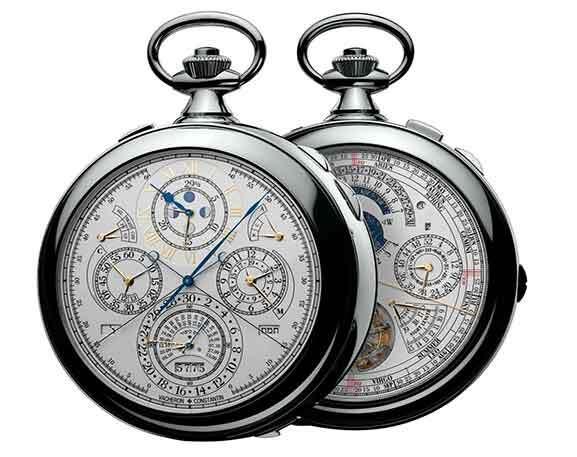 This masterpiece was presented by Vacheron Constantin in 2005 on the occasion of the company’s 250th anniversary. Incredible 834 pieces were needed to implement the 16 complications involved in this watch. The manufactory, which is one of the oldest in the world, made only 7 pieces, which cost $ 1,500,000 at that time. Among these 16 complications are an eternal calendar, a minute repeater, a second time zone, a tourbillon, an equation of time, and a star chart. The $ 2 million Richard Mille RM 56-02 case is made entirely of pure sapphire. This and the uniquely constructed clockwork with tourbillon make it a real milestone. It is not the sapphire crystal in itself so expensive, but the production of a housing made of this material, which is strong enough to withstand the everyday stresses. Of the RM 56-02, only ten were made, each taking 40 full days (40 x 24 hours) – just for the case. This is the only watch on this list that carries its price in the name. This Hublot seems to be designed exclusively for real “big players”. This is not only due to their price (or their name), but also to the extravagant piece itself. 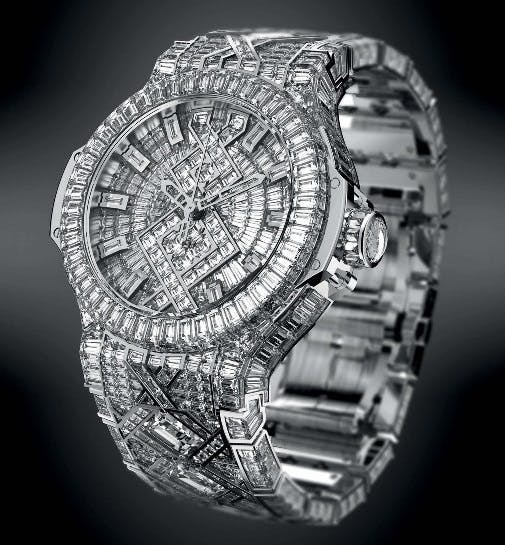 The watch is set with more than 1,200 diamonds, which together equal 140 carats. The grasping of the stones was realized by the Geneva Atelier Bunter. It’s hard to see, but the case is white gold. Inside is the HUB1100, a work with a pure time display. It is also the only watch whose high price comes mainly from the diamonds instead of their complications. Several years ago Greubel Forsey presented the Art Piece at the SIHH, a watch created in collaboration with Willard Wigan. Miniature artist Wigan made nano-sculptures that were used in the Art Piece. Through a small microscope in the edge of the case at 9 o’clock, owners of the clock can admire the creations of Wigan. 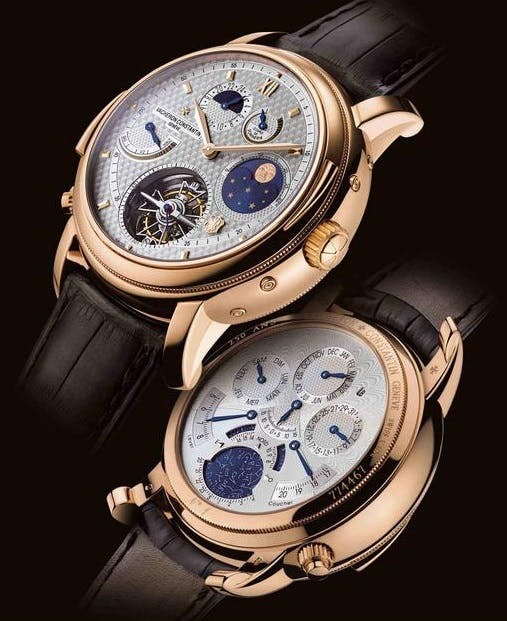 In addition, the Art Piece 1 has a double tourbillon. Their selling price was 1.5 million Swiss francs. To make the dimensions even clearer, the nano-sculptures (such as a sailing ship) fit into the eye of a needle. Patek Philippe has been known for many decades as a master of horological complications. However, this Sky Moon Tourbillon plays in a completely different league and was a sensation at its launch. This masterpiece is something very special even for the circumstances of the brand: 13 complications on two dials – not many watches can come up with that. In addition to the pure time display, it has a perpetual calendar, a minute repeater, displays for the phases and angular motion of the moon as well as for the sidereal time, and a star chart. It can be yours for about 1 million euros. Pocket watches basically offer more space for complications. The Vacheron Constantin Reference 57260 measures approx. 50.55 mm x 98 mm, for example. There are several reasons why these watches are so incredibly expensive. At least that’s what the producers of these pieces say. The use and quantity of valuable materials such as diamonds, platinum, etc. The complexity of the work or, technically speaking, the number of complications in the clock. Exclusivity – if a manufacturer puts a lot of his energy into the production of just one or two watches, he has to charge an astronomically high price, especially if the above two points also apply. Of course, marketing costs and the value of creative work must also be included in the price. As a watch enthusiast, I believe that a watch becomes really valuable only through a highly complicated movement , since many hours of the highest craftsmanship flowed through its development and production. Of course, great craftsmanship is required to pick, grind, polish and set diamonds.